If your business is in the automotive, aviation, aerospace, construction, food and beverage, medical, or manufacturing industry, or something entirely different, using aluminum extrusion profiles can yield incredible results. Whether working with top aluminum profile suppliers for a standard product or directly with the manufacturing company for a customized solution, you will get tremendous benefits in exchange for your decision. Although standard aluminum extrusion profiles have a lot to offer, you will benefit even more by choosing a customized product. Either way, as long as you do business with the right company, you will end up with an extruded profile that meets your specifications and tight tolerances. 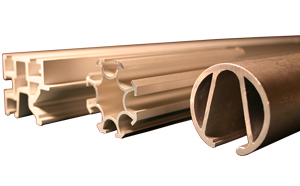 The following are some examples of the benefits that aluminum extrusions provide. Lightweight – Aluminum is much lighter than other metals, making it easier to mold and shape and less expensive to ship to customers. The lighter-weight parts and components also reduce manufacturing costs for products made by many industries, such as vehicles for automotive and spacecraft for aerospace. Unrivaled Strength – As mentioned, aluminum is lighter in weight compared to other metals like iron, stainless steel, and brass. However, when the manufacturer adds magnesium, zinc, silicon, manganese, or copper, it becomes even stronger. Another way to enhance the strength of aluminum profiles is by using a specialized heat treatment. Resistant to Corrosion – Whether purchasing custom or standard aluminum extrusion profiles, this material resists corrosion. With a naturally occurring oxide film as protection, different industries can use finished products inside and outside without concern. For added protection and enhanced appearance, the manufacturing company you work with can create a variety of finishes. Thermal Conductivity – As a superior conductor of cold and heat, many industries, including the automotive, HVAC, and homewares industries rely on aluminum extruded parts and components for the consumer products they make. Machinability – Since it is a soft material, experts can saw, drill, cut, mold, shape, and machine aluminum. Because of that, top manufacturing companies can produce almost anything the customer requires. Malleability – Again, because aluminum is soft, it is possible to form, foil, roll, or bend it into multiple shapes. Malleability is one reason so many industries choose this material and process for end-use applications. Cost-Effective – Every business looks for ways to save money. While aluminum, like other materials, fluctuates in price based on current supply and demand, this material is usually less expensive than the majority of other metals. Remember, as a lighter-weight material, extruded parts and components do not cost as much to manufacture and ship. High-Temperature Performance – Even though aluminum softens above 400 degrees Fahrenheit, the manufacturer can add other metals to make the extruded profile heat-resistant. If there is extreme cold, this material strengthens, making extruded products essential for critical applications. Electrical Conductivity – Another benefit of choosing aluminum extruded parts and components over those made from other metals is the fact that this material can conduct over 50 percent as much current than copper of the equivalent weight. Aluminum’s electrical conductivity is why power companies rely on extruded profiles for high-voltage overhead lines. For all your aluminum extrusion needs, RPM Industries, LLC is your best source. With more than 30 years of experience and unparalleled expertise in manufacturing both standard and custom extruded profiles, we feel confident that we can meet if not exceed your expectations. For more information, we invite you to visit our website or give us a call.